Get ready to laugh the night away for a great cause! 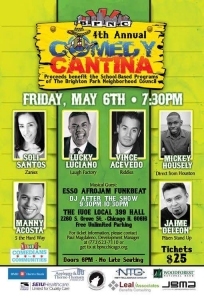 The Brighton Park Neighborhood Council (BPNC) and Mikey O Comedy Show will present their fourth annual Comedy Cantina on May 6th at IUOE Local 399 to help raise funds for BPNC’s school-based programs. This year, BPNC’s Comedy Cantina expects over 700 attendees to enjoy a night of comedy featuring six comedic heavyweights like Manny Acosta and Jaime De Leon with Afrojam Funkbeat providing eclectic sound. BPNC Development Manager Paulo Magdaleno spoke to Lawndale Bilingual Newspaper about how Comedy Cantina is helping BPNC’s programs and what people can expect at the show. Lawndale Bilingual Newspaper: Four years ago, The Brighton Park Neighborhood Council (BPNC) partnered with Mikey O Comedy Show to help raise funds for school-based programs. How did that partnership come about? Paulo Magdaleno: BPNC’s partnership with Mikey O Comedy Show came about through the agency’s Development Manager. The agency’s Development Manager previously worked with Mikey O’s Comedians for Communities and connected our Executive Director with Mike Oquendo to plan a fundraiser for the Brighton Park Neighborhood Council. Our collaboration with Mikey O Comedy Show was the agency’s first attempt at a fundraiser and were originally hesitant to commit to the event. Through Mike O’s vision and guidance, BPNC committed to our first ever Comedy Cantina show, which sold over 425 tickets. Since then, our partnership with Mikey O’s Comedians for Communities continues to grow and greatly impacts BPNC’s school-based programs. How exactly does this event help BPNC’s programs? One hundred percent of the proceeds go towards BPNC’s school-based programs. 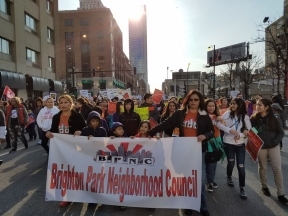 BPNC partners with five Chicago Public Schools in the Brighton Park community through the agency’s Full Service Community Schools Initiative (FSCSI). The agency’s FSCSI are strategic partnerships that address the academic, social-emotional, mental health, and health & wellness needs of students through after-school programs. In collaboration with the schools’ administration and teachers, BPNC designs programs that specifically meet the unique and cultural needs of each school. For the last three years, the Chicago Public Schools’ have seen a significant reduction to their overall budget (specifically, schools in Brighton Park have seen over $5.8 million dollars reduced from their school budget), resulting in drastic cuts of staff and critical supports for highly at-risk students. BPNC’s Comedy Cantina’s fundraising efforts ensures that we continue to provide essential resources to sustain programming for students that are at risk of dropping out of school. What would you like people to know about the annual Comedy Cantina? BPNC’s Comedy Cantina is a fun and interactive way to contribute to a great cause. This year, BPNC expanded the show to include live music from two local DJs and Chicago’s very own ESSO! Afrojam FunkBeat. People attending the show get to meet the agency’s staff, see a showcase of BPNC’s programs, contribute to a great cause, and enjoy the night with friends. If you would like to see the full lineup, visit www.bpncchicago.org.